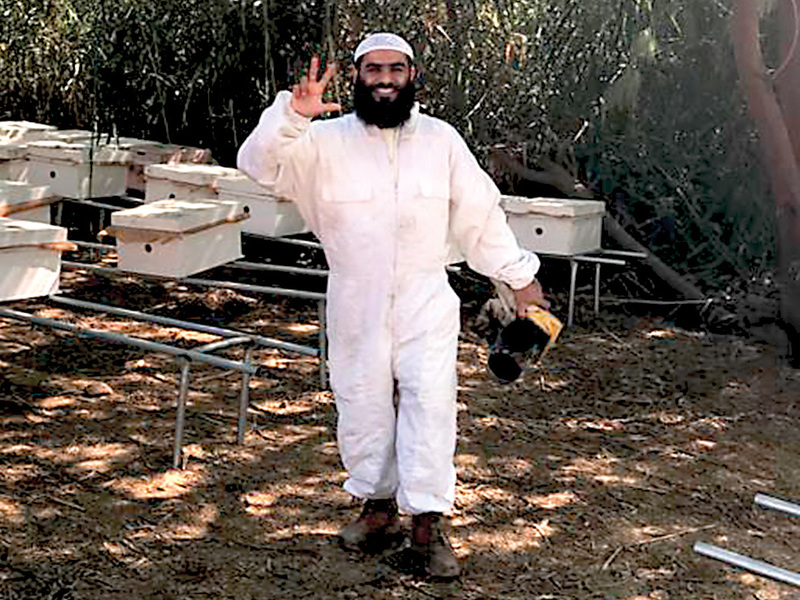 A master beekeeper by trade, Hatta-born entrepreneur Manea Ahmad Al Kaabi has dedicated his life to sustainable apiculture in the UAE. “Over the past few decades, things have changed immensely for bees,” says Al Kaabi, Co-founder of Hatta Honey, a beekeeping enterprise located amid the scenic mountains of Hatta. “Beekeepers are up against huge challenges such as increased pesticide usage, diseases and climate change, leading to unprecedented hive losses. “I come from a line of beekeepers and I have seen the change from the traditional ways of beekeeping in the region, where hives were made from the cut-out sections of palm trees, to the introduction of the modern Langstroth hives. One of the unique things in Hatta is the winter season, which is like spring in Europe and the US. We are able to produce queen bees during the cooler months from November to March, when nobody else in the world can produce bees. Here, we simply use the Gulf climate to our benefit. Considered one of its kind in the GCC, Hatta Honey, producing pure, unpasteurised and natural honey, was established in 2016 as a joint venture between two honey manufacturing companies, Hatta Honey and Al Najeh Honey. “Running an ethical, sustainable business is an important part of Hatta Honey and this is something I, along with my team, put at the forefront of our decision-making — even if it means making more expensive choices,” says Al Kaabi. Earlier this year, Hatta Honey became the only centre in the world to rear the highly sought-after Saskatraz queen bee, known for high honey production, outside North America. “One of the world’s newest strains, Saskatraz was developed and produced in Saskatchewan, Canada,” explains Al Kaabi. “The aim of the project was to produce a more productive, calmer, gentler breed with a strong resistance to parasites and brood diseases. “We were officially contracted through our parent company, ANHB Group. Hatta Station is the first official production plant for Saskatraz outside of America and Canada. While there is an increasing awareness of the sustainability issues among beekeepers in the country, education and an enhanced understanding of the ecosystem are key to environmentally sustainable apiculture. “When it comes to beekeeping in the Gulf, we have to take into account the harsh climatic conditions where temperatures sometimes climb to 50 degrees Celsius. It is normal for beekeepers in the region to kill their bees during the hot summer months and repurchase new bees the following year.